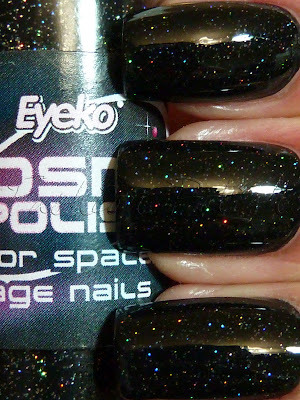 Short after I began wearing black nail polish, I felt the need something different, of course I still loved the glossy look of a deep black creme but how could I resist the dazzling holographic micro glitters of Eyeko Cosmic? Glitters are very hard to photograph, the second, blurry, picture give you a better idea of Cosmic but I really feel like I didn't manage to do justice to this amazing rainbow. You're looking at 3 thin coats but it applied easily and dried in a flash. Eyeko is against animal testing, their nail polishes are B3F and can be bought online here (worldwide delivery). 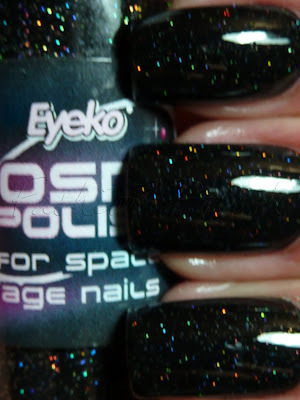 I ♥ this polish so much! :) And I think you did a good job photographing it. I did a comparision of this with some other sky-space polishes a while back if you're interested. Not gonna spam you with links, but its under the comparisons tag on my blog. p.s. I'm so loving monochromatic and black nails right now. Don't know why... I usually like colour. I don't think i've seen this polish much on blogs. it looks lovely. my nails are not as long and beautiful as yours I'm afraid due to my being an ex-nail biter! I just ordered this along with a couple of other Eyeko polishes. Your pictures are making more anxious to get this one on my nails! Love this! Wow, thanks so much for sharing. *dreamy sigh* I adore this one. So perfect. I think I'll run down my street screaming of joy when I get my hands on it.